Rahul Dravid of India, has become the second Indian Player and the fifth international player, to score 11,000 runs in “Test-Cricket” , in 135 matches. 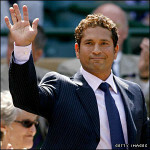 Sachin Tendulkar- India – 12,777 runs – in 160 matches. Brian Lara- West Indies- 11,953- runs –in 131 matches. Ricky Ponting – Australia – 11,345 runs – in 136 matches. Allan Border- Australia – 11,174 runs – in 156 matches.